Okay – so is that a clue? We basically have three young men, Len the bus driver, Mark who is an actor (p. 61) and Pete, a office clerk of some kind (p . They all live in the same small apartment which is the usual setting. Mark insists the room is moving. and sometimes outside. .There is also a cat in the room but sometimes it goes out – as do the characters. In fact that’s what they all want – out – out of the walls of the sexual and emotional limits on their lives. The guys go through a lot of male-type competition and banter creating tension but it’s Pete’s girlfriend Virginia who becomes a major focal point of the drama – and that’s what this book really is. A lot of fast paced dialogue takes up many of the pages although there are frequent monologues form one or the other of the characters. Much of the chit-chat is basically the kind the linguists say we really do in our kitchen-lives – at least stylistically. Each character acts and talks as his job would indicate – Len the bus driver (?) is at least a bit paranoid (I think it’s his apartment). Mark is artsy and talks literature and acting, gets on well with the girls. And Pete the office worker is logical – presents whole analyses of stuff. Len thinks of himself as a corner, Pete may be the walls and Mark the roof? Actually, it’s a lot of 1950s existential stuff mixed with a bit of James Joyce stream of consciousness and perhaps Beckett. 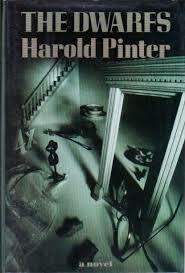 Pinter was in his 20s in the 1950s when he wrote this and that shows. I suppose it’s quite good but I’m not a fan of existential lit and the theme of the absurd or meaninglessness of life – it’s been done I guess.